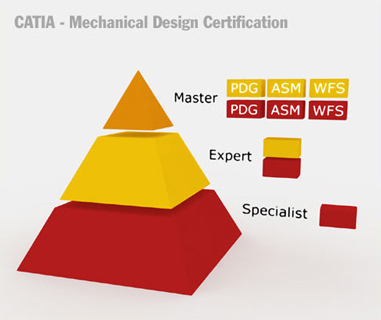 The CATIA V5 certification program supports three levels of expertise per application domain: Specialist, Expert and Master. Different tracks across these levels respond to career needs. Tracks correspond to CATIA products. Today, CATIA Certified Professional exams cover 3 tracks: Part Design, Assembly Design, and Surface Design. Within each track, three levels of certification are provided: Specialist, Expert and Master. The prerequisite to apply to the Master level being to be certified at the highest level in all tracks. 'Specialist' is the entry level. 'Expert' is the senior level. and expertise within a domain.